We were camped on BLM lands only a few miles south of the Ironwood State Prison south of Interstate 10 in the Mojave Desert. We left my van at the campsite and headed south in Tom's Jeep, intent on some easy desert adventures that would involve almost as much driving as hiking, exploring the Palo Verde Mtns and the Little Mule Mtns. The Palo Verde Mtns are a modest desert range found about 20mi SW of Blythe near the AZ border. Thumb Peak lies near the northwest end of the range and is featured in Zdon's Desert Summits though it appears he didn't climb it himself. Regarding an ascent, he says merely, "be prepared for 5th class climbing," which of course would pique any peakbagger's interest. With further digging, one finds in Purcell's Rambles & Scrambles a short entry noting a tricky class 2 route, though he declines to describe it in order not to remove the adventure from it. Daryn Dodge provides a useful description of this route on peakbagger.com from his party's 2013 climb, a convoluted route up a gully on the southeast side. I went into this hoping we might find an alternate route, preferably shorter, on the west or south side of the peak. We parked along the Milpitas Wash Rd west of Thumb Peak, some 15mi south of Interstate 10. This well-maintained dirt/sand road can be driven by any vehicle to this point, just over two miles from the summit. The road forms the western edge of the Palo Verde Mtns Wilderness, but there are the remains of old mining roads that can be used to good effect in getting one closer to the peak on foot. We started on easy ground leading into a sandy wash before climbing out onto firmer ground above, then finding one of these old jeep roads leading southeast. More cross-country followed and after an hour's time we had found our way to the west side of Thumb Peak. From afar I noted what looked like a diagonal ramp leading right to left up and through a large cliff band that surrounds much of the mountain. As we got closer it could be seen in more detail, but there was one section halfway up that seemed questionable. As is often the case, Tom was skeptical but willing to join me for a closer look. In the worst case it seemed like we might lose 20-30min and there were other options on the SW and south side that we could then explore. The ramp proved a good one, though not without some concern. At the dicey section seen from below, the ramp looked like a mountain road that has been closed due to a washout section. We could see the ramp continue nicely past the crux but it was first necessary to negotiate this exposed 10-foot section. Tom examined it before allowing me to go across first. After reporting good holds and something like a class 3-4 rating, Tom followed in short order. Happily, there were no other real obstacles. The ramp led up to the NW Ridge where easy class 3 scrambling was found on good rock, leading to the summit less than 10min from the crux. Mark Adrian and Richard Carey had left a register in 1998. An older scrap dating to 1993 was badly tattered and disintegrating even as I was trying to photograph it. Daryn's DPS party comprising half a dozen members were the last entry before ours. We were at the top perhaps 10min for a short break before starting down. The fastest way back would have been to use our ascent route but we wanted to see if we could find the tricky class 2 route on the SE side. Tom led us down the exposed class 2-3 SE Ridge before moving down onto the east side and then some traversing to find our way into the SE Gully. Once there, it was a simple matter to descend until we could exit left to the east side of the peak through a break in the short cliff that defines the northeast side of the gully. Once on the east side, it's a pretty easy walk around the mountain's north side and heading back towards Milpitas Wash Rd. Since we were passing right by it, we paid a side visit to Peak 1,145ft to the west of Thumb Peak in the way of a bonus peak. We continued west over the summit, exploring an old mine found at the base of that side, and then using the old road leading to the mine to find our way back to Milpitas Wash Road by 10:30a. 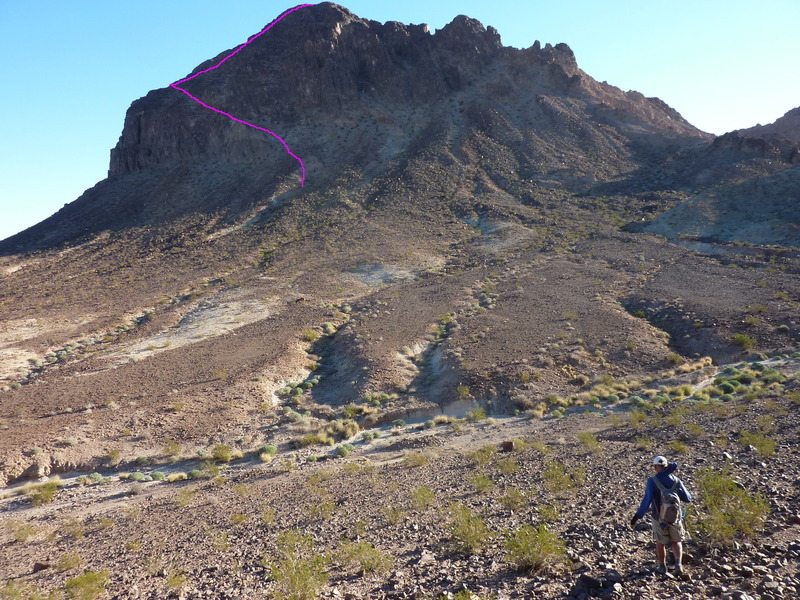 This small range is found about 15mi southwest of the Palo Verde Mtns, tucked against the eastern edge of the Chocolate Mtn Gunnery Range. We followed the Milpitas Wash Rd south through low hills on deteriorating road conditions (no longer suitable for low-clearance) into the very broad Smoketree Valley. The road turns to the southeast, eventually joining paved SR78 not far from where the Milpitas Wash joins the Colorado River. Not long after it bends to the southeast we turned right onto a series of poorer roads heading south and west. Smoketree Valley is a checkerboard of BLM and private lands, home to some of the sorriest-looking homesteads I've ever come across in the state. Out in what seems the middle of nowhere, 15mi from the nearest pavement, is a sparse collection of properties parked upon the broad Milpitas Wash, all of which will probably be wiped out in a 100yr flood. Or perhaps it already has been? Hard to tell. As we drove across the desert and wash I couldn't help but wonder what sort of folks would choose to live out here. There are numerous abandoned structures that could easily be squatted upon - the neighbors might think it an improvement. Many have battered trailers parked next to more permanent structures no longer inhabitable in their poor conditions. Cars and other junk many decades old are strewn about the properties. If someone were to die in their abode out here, perhaps a drug overdose or from the cold, from the heat or perhaps old age, alone and unnoticed, it could be years before someone else might find them. In all we spent about an hour driving from one trailhead to the next, so there was plenty of time to contemplate such life on the edge of civilization. Much as I enjoy the desert, this sort of existence seems harsh, at best. As we neared the range we followed directions provided by Evan Rasmussen, taking several side roads further west until we were at the base of the range not much more than a mile from the summit. The naval gunnery range boundary stairsteps through the Little Mule Mtns with our starting point outside the range, the highpoint at Arroyo BM just inside. There are no fences or markers along the route to mark the boundary, but there are unmistakable remains from military exercises in the area to warrant caution. A pair of jets flew overhead at high speed, making several passes before disappearing as quickly as they'd appeared. At least they didn't drop anything on us. The hike to the summit over easy ground (facilitated with burro trails) took only 30min, with less than 400ft of elevation to gain in the process. In addition to the benchmark, we found a MacLeod/Lilley register from 2000 with an older register scrap dating to 1995. Richard Carey was the most recent visitor in 2010, reporting green grass over the hillsides in mid-March - today, in December, all was mostly brown. We returned to the Jeep by the same route, then spent about 30min driving north to the second highest point in the range, only 11ft lower than Arroyo BM. We drove as far as the roads could take us on the SW side of the summit and then some, eventually stopping short of driving ourselves into trouble. We parked about 3/4mi southeast of the summit and hoofed it rom there, an even easier outing that the last. There was no register on this one, but there was a large cairn with a survey mast sticking out of the center. Our return went down the SW Ridge where we picked up a burro trail at a saddle and followed this most of the way back. We finished up by 2p which would give Tom more daylight to drive home by. We spent almost an hour driving back to where we'd left the van where we said our goodbyes before Tom drove off, leaving me to my own devices for the next three days.